The raging debate on political violence was yesterday tabled in parliament with Choma Central member of parliament Cornelious Mweetwa urging government to take practical measures to curb the vice. 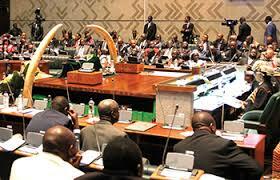 The private members’ motion on electoral violence moved by Mweetwa was seconded by Zambezi East MP Brian Kambita. Presenting the motion, Mweetwa observed that political violence could only end if the ruling Patriotic Front sought to uphold the rule of law. The Choma Central lawmaker said that Zambia had sufficient laws to stop continued violence but the problem was the failure by the leadership to ensure the laws were adhered to. He said the executive arm of government had failed to take appropriate action against perpetuators of violence fairly. Mweetwa said there was also need to recognize and respect human rights in Zambia as the current situation indicates otherwise. And acting Minister of Justice Stephen Kampyongo said it was government’s responsibility to provide leadership as they seek solutions to end violence. Kampyongo said violence did not spare those that ignite it and that it had devastating results. “Zambia has enough pieces of legislation to deal with these bad vices if only political parties could come to a common agreement,” he said. Kampyongo, who is home affairs Minister, said that the laws currently are equal to the task while political parties had a responsibility to leave a legacy for the next generation. He has since called on the spirit of unity and togetherness by avoiding being emotional as this could lead to subjectivity. “The way forward for all political parties is now to provide leadership than being antagonistic in resolving this issue,” he said. “The ruling party has no problem with the motion because it is timely and there is need to put the issue of violence to bed,” he said. Kampyongo has also urged ECZ to continue calling on meetings and engaging various political parties so that they may be educated on electoral violence.